This assembly is a floating installation on a light wood-frame structure and concrete topping. 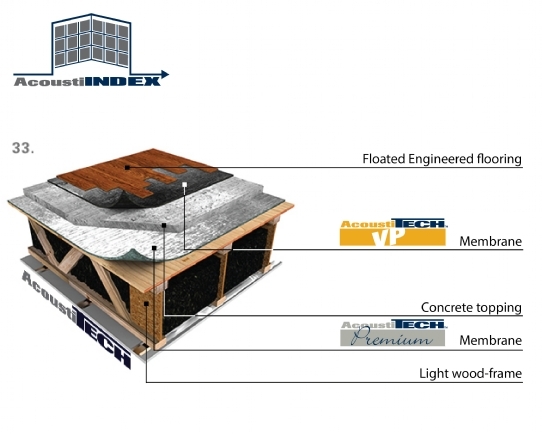 The AcoustiTECH VP membrane was installed under a wood or laminate floated floor. The AcoustiTECH expertise goes beyond the acoustic products, providing you with support for your project (analysis of the plans, proposed various solutions to meet your needs and budget, etc.). This acoustic result (IIC) is a projection of the results obtained from acoustic tests in different floor assemblies. In a similar building with a structure having the same characteristics, it may be that the acoustic performance differs depending on the quality of execution of the installation work, the surfaces and the selected materials. To get more details about this test, please contact us at 1-888-838-4449 or service@acousti-tech.com mentioning the test number you have consulted.